(c) 2011 Chris Baylor licensed to About.com, Inc. The Dremel 3000 High-Speed Rotary Tool is the next step in the evolution of the Dremel rotary tool line. This Dremel 3000 rotary tool has some useful features, including the EZ Twist integrated wrench/nose cap, which allows the user to loosen or tighten the collet and replace an accessory quickly and easily without the need for a collet wrench. The kit comes with a pair of attachments and 28 accessories, all in a hard-shell plastic carrying case. The EZ Twist integrated wrench/nose cap allows the collet to be tightened/loosened without a collet wrench. Includes 1/8-inch, 3/32-inch, 1/16-inch and 1/32-inch collets for various accessory shank sizes. Variable-speed 120-volt, 1.2-amp motor with no-load speed settings ranging between 5000-35,000 RPM. Includes a very helpful set of well-written operating manuals. The Dremel 3000 rotary tool is the latest in the long-standing line of Dremel's signature tool line, and for rotary tool fans, this one doesn't disappoint. Inside the operating manual, you'll find listings for the recommended speed settings as well as charts denoting on what materials each accessory is designed to be used. 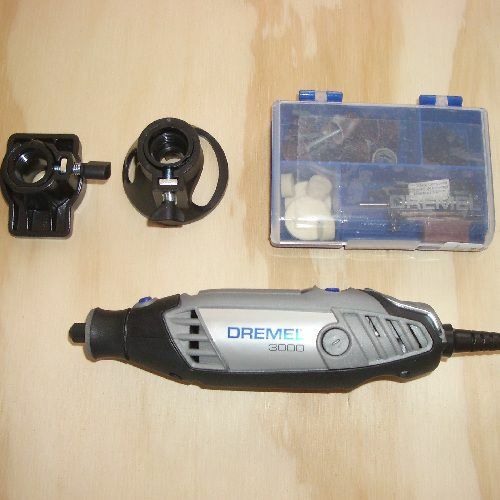 The Dremel 3000 also includes handy features such as a shaft lock button (to hold the motor in place while changing accessories) and an adjustable hanger on the back of the motor housing. If I could make one recommendation to Dremel's design team, it would be that I would prefer to see the on/off switch separate from the variable-speed switch. This would allow users who like to keep their rotary tool set at a specific speed from having to adjust the speed every time the unit is turned on. Of course, this task can easily be handled with a switched outlet or an AC foot-switch (accessories you can easily find online) for hands-free on/off operation. Other similar rotary tools include the Dremel 4000 Rotary Tool and the Dremel 300 series High-Speed Rotary Tool.